The US 60/65 interchange in southeast Springfield, one of the busiest interchanges in southwest Missouri, must be upgraded to improve traffic flow and overall safety. approved by voters. Though funding does not yet exist to replace the entire interchange, there is enough money to begin providing relief. Initial phases of construction will begin in the summer . What will the new interchange look like and how will it function? What portions will be built first and how will construction be phased? You can help us decide by telling us what is important to you. Your input will help us to identify important needs and issues as we begin to consider design concepts and make plans for construction. 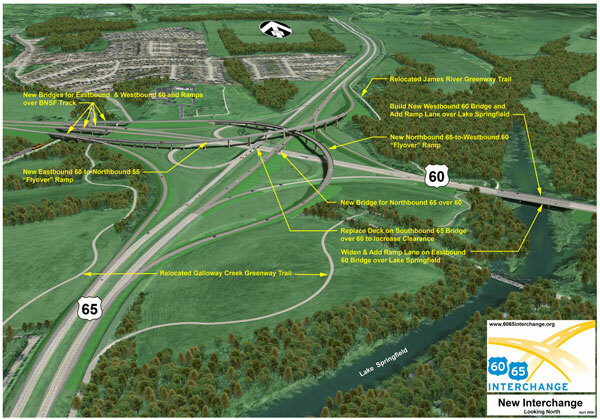 Use our web site to participate in the design process for the new US 60/65 interchange. Read background information on the project, view preliminary design concepts as they are developed; attend public meetings and send us your questions and comments. EVS08: It’s the Plug, Stupid! What’s the impact of "green" business? Japan harnesses new form of bio-energy: electric eels! An Inconvenient Truth: US doing better on climate change than Europe? Will the US be rewarded for failing to ratify Kyoto?